No one can build a new home every year. However, anyone can keep up with the latest trends in home construction and design. Enter the annual International Builders’ Show, which showcases the newest concepts in home design, construction and remodeling with two houses – The New American Home and The New American Remodel. 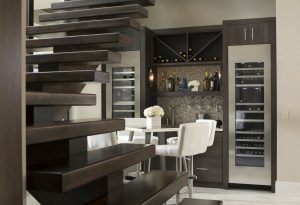 This year the two homes will make their debut at the show in Las Vegas February 19-21. They may have a hard act to follow with the two homes that were unveiled at last year’s exhibition in Orlando, Florida. 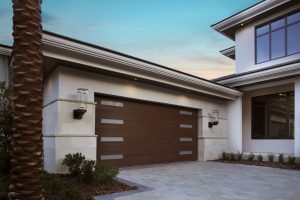 The 2018 New American Home, a Mediterranean-inspired, 6,533-square-foot home in Montverde, Florida, showcased modern design elements in a structure where people still could live in comfort and style. An 80-year-old Orlando house served as The New American Remodel, which blended elements of the original design with new construction. The modern Tuscan-style NAH featured clean lines, a neutral color palette and Italian flourishes. Built of stone, stucco and wood, the home also featured modern elements such as large windows and a floating interior staircase. The exterior included a Mediterranean pitch roof, deep overhangs and flat-concrete roof tiles. With an H-shaped floorplan, the home was designed so that whole sections could shrink or expand without losing the plan’s integrity. Pocket doors and retractable glass doors throughout the house allowed spaces to be opened up for large gatherings or closed off for quiet and privacy. The floorplan also embraced the outdoors, offering views of the swimming pool, spa and nearby lake from nearly every room. Automated and easily operable screens and glass walls protected the indoors from insects and the elements while still giving the feeling of living outdoors. The core of the house featured an open kitchen and a great room with a covered porch that opened onto the swimming pool patio. These central rooms were surrounded by auxiliary spaces such as a home office, powder room, laundry room, mudroom, guest suite, game room and master suite with its own covered porch. In the kitchen an eat-in peninsula was part of the main island, and the room was fully open to the dining and great rooms. Folding glass doors made it accessible to the pool area, and a large walk-in pantry was adjacent to the game room. The master bedroom featured a rustic-looking backdrop to the bed, a stone fireplace and a retractable glass wall that opened onto a side porch. LED lights under the edges of the bed made it appear to float. Reminiscent of ancient Roman baths, the master bath featured a free-standing tub on a mosaic floor. The glass-enclosed shower offered his-and-hers automated control settings. The bath also included his-and-hers water closets, his-and-hers walk-in closets and separate vanities. The second story featured a trio of bedrooms, which each had full private baths; a loft with a wet bar and a coffee bar; a powder room and a second laundry room. A media room included double barns doors on one side and a glass wall to the balcony on the other. The house even had a pair of two-car garages, including one with garage doors on each side so drivers never had to back out. LED backlighting enhanced focal points and added elements of mood lighting. A control room near one of the garages handled all of the automation for the house, which had only two light switches in the entire residence. In addition to automated lighting, the house also included automated shades as well as entertainment, temperature and security systems. Other technological advances included premium audio, which delivered high audiophile sound quality to every room with reduced cabling and low power consumption; high-performance networking, which provided more power, increased memory and high-speed communication between all devices throughout the home; and user friendly controls, which could control nearly every gadget in the house with voice recognition, web browsing, H.264 streaming video, a built-in camera and an advanced media player. For last year’s New American Remodel, preserving the home’s 1930s charm, while fast-forwarding to a 21st-century lifestyle, was paramount to the project. The house not only featured renovations, however. A spacious great room, which led to an outdoor living area, and a gallery that connected to the master suite and office, were added to the home. Subtle design elements throughout the house wove each individual space into a unified work of art. For instance, circular design patterns in the formal dining room were duplicated in other areas such as the front door moldings and the circular front window. Interior doors had a similar three-panel design. Accented by long sight lines and striking focal points, the remodeled house showcased balance and symmetry. The gallery floor, for instance, featured an interwoven design of tile and hardwood while ceiling beams created a cross pattern that mirrored the tile-and-wood flooring pattern. A once-cramped kitchen was relocated into an addition that adjoined the great room. The new kitchen featured double islands with ample space to cook, eat and entertain. While a hammered and polished metal hood above the stove created a dramatic focal point in the room, steel casement-style French pantry doors connected the exterior architecture with the interior design. Designed to resemble a boutique hotel suite, the master bedroom was a relaxing retreat with blue-gray furnishings and accessories. A hand-crafted stained-glass window, featuring design elements from the light fixture, topped the window in the sitting alcove. In the master bath, the porcelain tile on the floors and shower walls emulated Calacatta marble. Octagonal details on the trey ceiling, plumbing fixtures and cabinet hardware created a complementary geometric motif. The décor of the remodeled home featured a neutral color palette, accented by elegant furnishings of Prussian blue velvets with splashes of teal and gray-beige tones. Gold-tone metals added warmth while the trim included driftwood finishes. The outdoor kitchen featured cabinetry that could withstand the elements; low-maintenance, solid quartz countertops; and a chiseled granite backsplash. The versatile, hand-cut, gray-green stone, which was mined from India, was used on all of the walkways, steps, driveway and pool coping and deck. The exterior was enhanced with new brickwork, restored ironwork and new windows. To maintain the character of the residence, the new additions mimicked the original architecture. Even though the home was built during a time of economic hardship in the nation, the remodel featured a wealth of technological advances and full-home automation that could be controlled by smartphones and tablets. These features included structured wiring where all network connections were in a central location; closed-circuit television security, which could be operated and monitored through any secured smart device; surround sound; automated lights that could be customized to user preferences and controlled remotely from anywhere in the world; motorized shades to allow the optimum amount of light in any room; high-performance Wi-Fi network that provided communication between all devices throughout the home. The New American Home and The New American Remodel 2019 will be unveiled at the International Builders Show February 19-21 in Las Vegas. At the 36th annual show this year, TNAH and TNAR once again will feature the latest in building trends, products and techniques. This year’s TNAH, a 9,028-square-foot, one-story house built in nearby Henderson, Nevada, will incorporate a wide variety of contemporary-modern elements into its design. Along with the latest technology, the home will highlight ultimate views and design, optimized energy efficiency and technological advances. This year’s TNAR, which was built in 1950 near downtown Las Vegas, will showcase the ways that today’s industry products can be integrated in an older home to enhance its technological and energy efficiency.The design criteria for the remodel includes elements that today’s luxury homebuyer wants such as multigenerational living solutions, function and storage, ideas for entertaining and low-maintenance materials. Published on January 31, 2019 in In The Home.